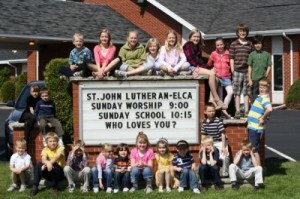 Our Sunday school program at St. John is open to all students from Pre-Kindergarten through 6th grade. Each week, children also participate in a special music time where they are able to praise God in song. Periodically throughout the Sunday School year, our children sing during a worship service and share their musical talents with our entire congregation. Our Sunday School meets weekly on Sunday mornings from 10:15 a.m. – 11:15 a.m. from mid-September through mid-May. We look forward to working with your children and ask that you pray for our Sunday School staff members that have volunteered to assist with the youth ministry at St. John’s. We welcome any comments or suggestions that you may have. 10:15 a.m. - 11:15 a.m. Last Day of Sunday School - Fun Day!